Knife-wielding robbers stole eight French bulldog puppies from a home after threatening a pregnant mother and her children. 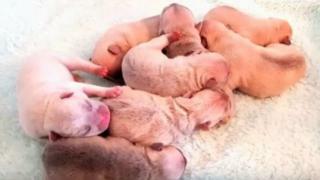 The men seized the day-old puppies from their 26-year-old owner at the home in Stretford, Greater Manchester. Two or three men are thought to have been involved, using a knife to scare the woman and her three young children on Tuesday night. Pedigree French bulldog puppies can sell for more than £1,000 each. Greater Manchester Police have released CCTV and appealed for anyone with information about the "terrifying" robbery to contact the force. Det Sgt Dave Jones said: "It's completely shocking that a pregnant woman and her three young children have faced such a terrifying ordeal, and we are determined to find the men responsible. "The puppies are only a day old, and they won't survive for long without their mum, so they need to be brought home as soon as possible." The family were unhurt and dialled 999 after the men fled. It is thought they drove up in a car before knocking on the door at 21:50 GMT. The mother answered the door before the men forced their way in, GMP said. They demanded cash and mobile phones before stealing the puppies. Det Sgt Jones added: "As well as finding the offenders, an immediate priority is to find these puppies. "I need anyone with information about the whereabouts of the puppies, or the men responsible, to please contact police as a matter of urgency." The RSPCA said French bulldog puppies sell for "at least £1,200" but can cost "far more". A spokeswoman added: "They need very intensive looking after with bottle feeding and warm conditions. "At this age it is imperative they have their mother's mother's milk and care."